Appropriate Humidity and Temperature — it’s the correct temperature and humidity which decides the proper airflow in the server rooms of Data Center. Many people are living in the misconception that serve rooms should be cold for the best output of the machines and also very less monitoring should be done. Thermostat is the only temperature sensor device in many Data Centers. Its good to keep the servers rooms cool but not below the room temperature of the whole site. 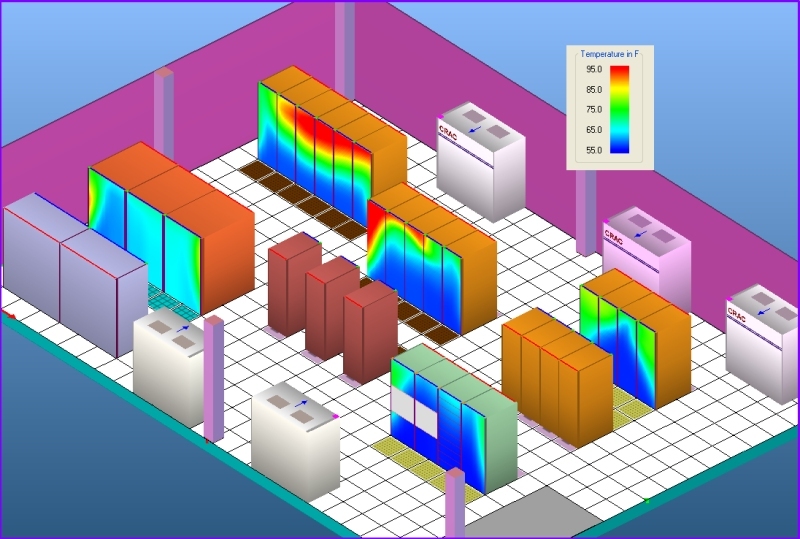 Best suited temperature for the server rooms is between 65 to 75 Degrees. Very often temperature is lowered to 65 degrees in many Data Centers, but its not suggestible. Computer equipments work properly only in a particular temperature range. For keeping the Data Center warmer by a single degree can save upto 5% of power consumption. There are some machines which works in rather higher temperature ranges say upto 95 Degree, but most of them works in lower ranges. Overheating of the machines can damage them and can cause the expected downtime, which is definitely not good for your business. Other problem that can arise from lowering the temperature below the range is increase in Humidity levels. Best suiting humidity for a Data Center ranges between 45%-55%. Too much cooling can increase humidity and thus leading to condensation which further causes hardware failure. If you want to detect humidity and temperature throughout the Data Center, you will have to install proper sensors. To ensure all equipments are working properly, sensors should be installed throughout the Data Center. One of the detectors suggested is CRAC units which not only works for longer periods also they consume very low power. Hot or Cold aisle — its is suggested to configure your computer equipments in either cold or hot aisle in a Data Center. Hot or Cold aisle layout supports proper flow of cold or hot air, overall reducing the work of HVAC ( Heating, Ventilation, and Air Condition) cooling system and equipments. In these layouts servers are placed facing each other in pairs, back of one pair of server face the back of the other pair. All the computers and other equipments are made in such a way that cool air enters from the front part and leaves from the back of the equipment. Placing servers facing each other promotes the flow of cool air from the front and flow of warmer air from rear parts of the racks. Hence this process is called “cold” aisles and “hot” aisles. Using the properties of both hot and cold air hot and cold aisles reduce the work, which other mechanism do with the help of power consumption. In other mechanism every time when hot and cold air is blended together, heavy work has to be done by the internal cooling machines and CRAC units. Computers which are not able to inhale cool air from front, should be placed away from the racks. They have to be installed in such a way that direct warm air wear out toward hot aisle. Other option is using special cabinets which are capable of redirecting either side ventilated or top wear out of the rack. Circumvent Air — any air conditioned air that is not utilized by the server equipment is called Circumvent or Bypass air. Bypass air leads to airflow inefficiencies inside the layout of the Data Center. Air is ascended through pierced tiles on the ground. Often Bypass air enters through small irregularities in the floor, like holes created to permit network or electric wires. If possible keep these holes sealed to minimize the effect of the bypass air. One more place other than the floor where you can find bypass air is cut-outs on the back of the server cabinets. Cable wires which escape from the rear of the cabinets should be sealed properly. Floor Tiles — Cold Aisles require perforated or punctured tiles to promote the flow of air from the floor to the servers. These perforations take advantage of the property of cool air and reducing the work of HVAC units. On the other hand Hot aisles don’t need these perforations as warmer air which returns to the air condition ducts is not disturbed. When the machinery is moved in the Data Center respective grates is the clod aisles should also be moved to support the free flow of the cooler and hot air at maximum intensity.